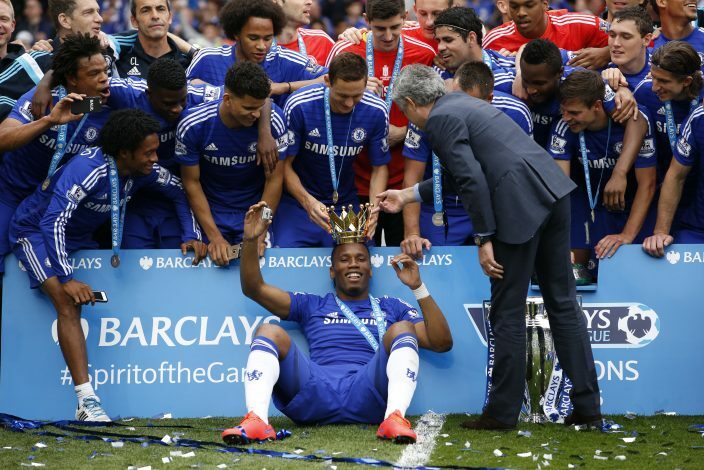 Chelsea have a lot to thank Didier Drogba for, as the Ivorian calls time on a stellar career. The striker was responsible for providing the Blues with memories that will last a lifetime, including a Champions League trophy in 2012 in the most stunning of circumstances. But, as it turns out, things could have been so different. Drogba has revealed, as is reported by the Mirror, that he was very close to leaving Chelsea after just one season, but it was one particular speech by manager Jose Mourinho that motivated him to stay put. “There was a time after the first season I was looking for that comfort zone, which means going back to Marseille to be the only striker with the team playing for you,” Drogba revealed. The forward’s words echo his feelings after just one season at Stamford Bridge, where he was nowhere near the undisputed number one striker at Chelsea, and had to fight for his place in the team. “But here, there’s 22 kings. So you ­accept it, work ­together, or you go — go back to where you came from and be the only king where ­everybody is behind you. Fans of the former Premier League Champions will be relieved to know that he made the right decision and decided to battle to stay on the pitch week in and week out.